Here’s a choice that not many of us will be making. Should you get the 2013 Yamaha Venture GT or save US$2,000 and buy the 2013 base version of the tried-and-true Yamaha Venture? The answer is yours. For model year 2013 Yamaha shows quite a distinct difference between its “base” Venture and the more luxuriously appointed Venture GT version. In reality, the GT shares more commonality with the extra-length 151-inch long Venture TF, which was brought into the US market via Canada and is now shared across the North American product line. Expect solid performance from the Venture’s carbureted Genesis triple. Indeed, in case you missed it, Yamaha snowmobiles in Canada and Yamaha snowmobiles in the United States essentially has become Yamaha North America, although no such official entity exists. In the very recent past, certain Yamaha models reflected the product needs of one or the other company. Yamaha in Canada featured a two-stroke Bravo years after it had been discontinued in the US. This melding of models brought the US two new snow vehicles for 2013, the aforementioned Venture TF and the Phazer-based Venture MP. 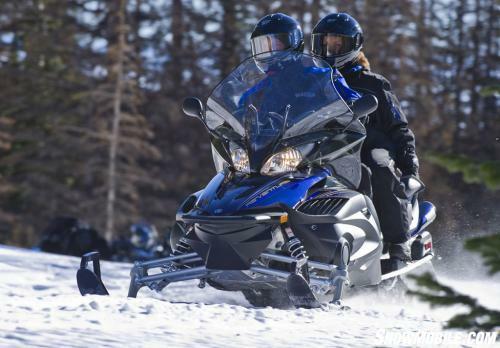 We can only guess that all future Yamaha snowmobiles will be shared across the North America snowbelt. Electric power steering and the latest fuel-injected engine make the Venture GT excellent for long distance rides. Two of the current shared sleds fall into the somewhat popular two-up touring category. Somewhat popular may be a disservice as that niche seems to be falling further and further behind as a percentage of sled sales. That makes it a bit puzzling why a company like Yamaha has so many versions of two-up units. The one-liter Venture and the 500cc Venture Lite satisfy the budget-minded buyer. The Venture GT offers the serious touring rider features unavailable on any other two-up luxury model, while the Venture TF and 500cc Venture MP seem less touring-oriented and much better suited to utility work. Luxury touring includes two-up seating with an adjustable backrest, rearview mirrors, gas shock package front and rear, and in the case of the Venture GT, light-steering effort from standard EPS. Yamaha gives you five assorted Venture models to very thinly slice a decreasing portion of its sales pie. Although this touring and utility market has become less important in North America, according to industry experts this niche shows increased demand in foreign markets such as Russia and its former satellite states. Winters are still long in Siberia, comrade. Keeping the worldwide market in mind helps explain the retention of the base Venture. The Venture GT may be one of the few upgraded snowmobile models that can not only justify its extra US$2,000 of price, but make it look like a bargain in the process. The base Venture shares a “series” name with the GT and little else as it has been redone recently. 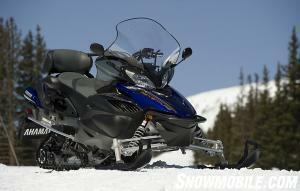 The base Venture is and has been a terrific snowmobile. Rugged and reliable, but surpassed by the GT version in virtually all ways. Under the GT’s hood lies a larger four-stroke Genesis tripe that displaces 1049cc versus the base model’s 973cc. Looking at the specifications tells you that the two motors use the same 66.2mm of stroke with the GT enjoying an overbore from 79mm to 82mm. Crisper throttle response and overall better performance come from the GT’s 41mm Mikuni throttle body electronic fuel injection versus the base model’s continued reliance on the throttle rack-activated trio of 40mm Keihin carburetors. While both Ventures feature Yamaha’s ProComfort rear suspension, there is a difference in shock type where the GT enjoys “clicker” adjustability. This will be sigificant for some buyers. If you work or travel in remote locations or prefer to do your own tuning work, the carbureted Venture may be a good choice. Serious long haul riders will want the benefits of Yamaha’s fuel injection engine, which is more of a detuned Nytro performance triple than an upgraded carbed Venture one. While both utilize Yamaha’s YVXC clutching system, we find the GT much smoother overall. And, here’s a standard feature that just about seals the added value of the GT. It comes with Yamaha’s electric power steering system. An exclusive to Yamaha feature, EPS makes the GT very desirable for a duo of long-mile tourers. This feature separates the two Ventures in a hurry. The GT with EPS is fitted with the latest version of Yamaha’s unique Deltabox ride-forward chassis. The Deltabox III has been refined expressly to maximize the capabilities of electric power steering. That also goes for the GT’s front suspension geometry and trail ski. Covered storage, a cushioned seat and adjustable backrest make the GT a top touring choice. Fundamentally the Venture GT reflects the newest engineering and design tweaks seen in the Vector and Apex models. The base Venture carries over the older carburetted engine, chassis, steering and front suspension setups. 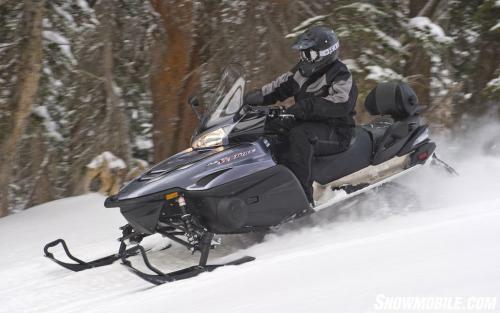 Although the two sleds share a similar rear suspension in Yamaha’s ProComfort 144, the Venture GT gets an upgrade to a 40mm high-pressure “clicker” shock for quick and simple ride adjustability. Both models offer more than a foot of mogul-absorbing travel. When it comes to overall features, the two Ventures enjoy similarites with rearview mirrors, a DC outlet for accessories like a GPS, mechanical reverse and the fuel-efficiency and broad torque of Yamaha’s four-stroke snowmobile engines. You will consider the price difference between the two. 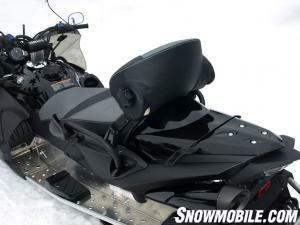 You will think about how you will use the snowmobile and which model best suits you. You will also understand that either model will last many seasons, so you’ll want to make the right choice after careful deliberation. And, if you are a rider who enjoys packing for a long ride for hundreds of miles over groomed trails, we figure the benefits of the GT outweigh the initial price difference. But, if you want a sled that can carry you into the bush and you think simple is better, the base Venture will save you some serious cash up front, provide you with ample features and last many seasons to come. The Venture GT costs more, but it has the newer, more sophisticated fuel injected engine, plus electric power steering. The base model shares similar features and costs less. Which one do you choose?